I can heartily recommend the exhibition H.M. Bateman: The Man Who Went Mad on Paper which is currently at the Cartoon Museum in London. For sheer draughtsmanship it's one of the best shows I've seen there. 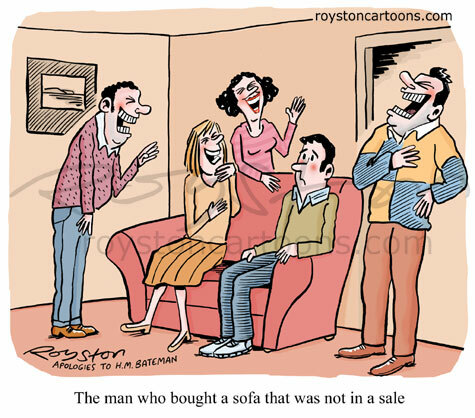 Bateman was famous for his "The man who ..." cartoons, depicting social gaffes of the day. The cartoon above, which appeared in Prospect last year, is an attempt to use the Bateman template in a modern scenario. Quite a few contemporary cartoonists have done this. It was fun to draw, mixing my own style with elements of Bateman's. 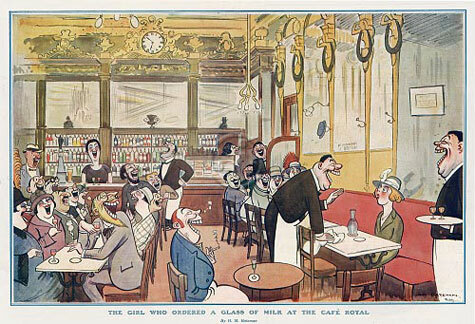 I used The girl who ordered a glass of milk at the Café Royal, below, as inspiration. Love Bateman. Will definitely try to get to the exhibition. 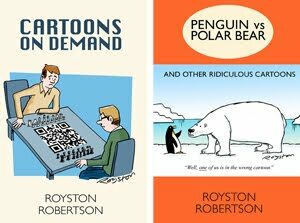 A battered old collection of his cartoons found in my grandfather's study was one of my earliest introductions to cartoons...along with the Beano and Asterix, as standard! You'll love it, Huw. There's some quite stunning stuff in the show.